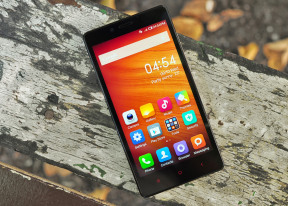 Xiaomi Redmi Note relies on a 5.5" IPS display of 720p resolution, which makes up for a pixel density of 267ppi. There is no special protection for the display, just a regular glass. You should be more careful while handling the Redmi Note as it might accumulate scratches faster. 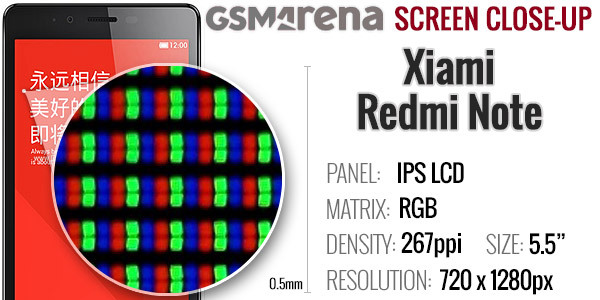 Here is the display matrix of the Xiaomi Redmi Note shot with our digital microscope. Taking a closer look at it reveals a standard RGB arrangement of the sub-pixels that make up the Xiaomi Redmi Note LCD panel, not that we've expected anything else. The display on the Xiaomi Redmi 1S is decently bright at 100% with great contrast and colors. Unlike the Redmi 1S, the Redmi Note remains nicely bright at its 50%, setting. The color reproduction is the same as on the 1S, but the contrast is somewhat worse. The major difference is visible only in completely dark rooms though. The sunlight legibility is a lot better than on the Redmi 1S as the screen glass is notably less reflective. You should be OK seeing what's on the display in the bright sunny days even if it won't be a pretty sight. The far superior sunlight legibility has another meaning too - while the Redmi 1S panel has higher contrast in complete darkness, the Redmi Note quickly catches up when the ambient light increases. So while the smartphone might be better in your bed, in your house or office the phablet offers better contrast and in turn image quality. . It's worth mentioning that the Redmi Note offers an option to prevent pocket dials. If enabled, you won't be able to unlock the screen while something is covering the proximity sensor. Xiaomi has put a 3,200mAh battery inside the Redmi Note and it is removable, so you can replace it anytime you want or carry a spare if you need to. 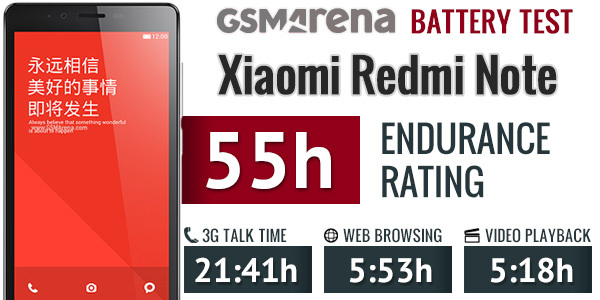 We ran our battery test and the Xiaomi Redmi Note scored an endurance rating of 55 hours, which means you can count on over two full days if you do an hour each of calling, web browsing and playing video per day. The phablet showed great endurance during the 3G call and standby tests, but the big screen took its toll on web browsing and video playback performance bringing the overall score down. This suggests that heavy users will actually be getting rather limited power autonomy, while those who mostly use their phones for calling will be able to get more than our rating suggests. For a more detailed breakdown of the Xiaomi Redmi Note battery performance check out our blogpost. LTE is the obvious thing missing here, but that's hardly a frequent occurrence among the phones as affordable as the Xiaomi Redmi Note. In fact this one has an LTE version, but that's single-SIM only and is only available in China. The rest of the connectivity features include Wi-Fi b/g/n, Wi-Fi Direct and hotspot. There is also support for Bluetooth 4.0, GPS and GLONASS, plus an FM radio with RDS. There is a microUSB 2.0 port for charging and data connections. Media transfer mode is supported for accessing the phone's built-in memory and microSD card over the USB cable. The microUSB 2.0 port can also be used in USB On-the-go mode for connecting USB peripherals such as pen drives, keyboards or real USB hard drives.